Flex your fingers, Highest Trader Kaun begins in 10 mins! We've also slashed our trading fee on all BTT/USDT trades till tomorrow 7.30PM! 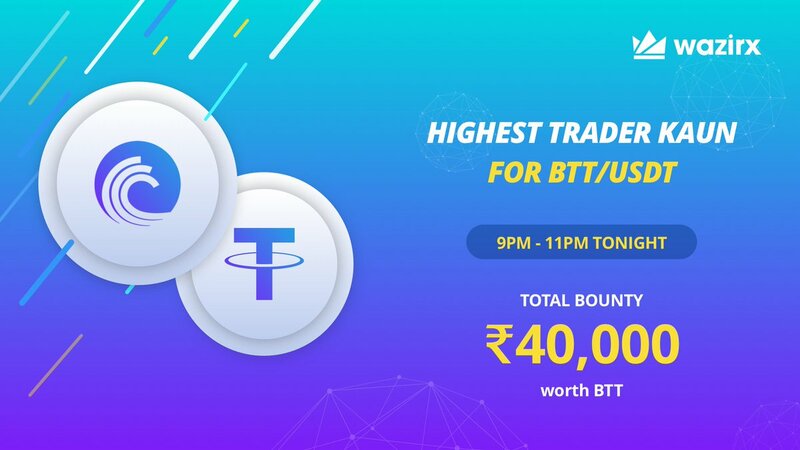 Trade and win up to ₹10,000 worth &dollar;BTT in tonight's Highest Trader Kaun! Prizes for top 10 traders in terms of volume & number! It starts in 30 mins! Get ready to trade and win some &dollar;BTT in tonight's #HighestTraderKaun! 🚀 More info (and a surprise) to follow soon! @WazirXIndia @BitTorrent still I have not received BTT token yet. Why ?? @justinsuntron @WazirXIndia have not received the BTT from you guys yet. Please provide an update. @WazirXIndia when BTT airdrop on Wazirx?? @WazirXIndia @BitTorrent Have you taken the snapshot or still not? Do you like H&M? Then you’ll like this #news even more. Their distributors will reportedly start accepting payments in &dollar;ETH, &dollar;LTC, &dollar;BCH, &dollar;DASH and &dollar;BCD! @WazirXIndia So if I sell all my TRX at 7:01 p.m, I would still get BTT right? @WazirXIndia And will trading be halted? @WazirXIndia @BitTorrent Didn't you mention in the previous tweet that snapshot time will be 2 pm? What happened then? @NischalShetty @WazirXIndia Why no xlm withdrawal..?? @WazirXIndia @WazirXIndia Time of airdrop in GMT?